The weather in Sochi is one of those things that can really make your day. Since the Games began, it seems as if Mother Nature has decided to play along with the Olympic organizers. Down in the Coastal Cluster, when you come out early in the morning and breathe the fresh sea air, it feels like May. Even the scents here resemble those that fill the air in late spring. The air is warm enough by noon to take off your coat without any risk of catching a cold. In reality, your body gets completely disoriented. The calendar may say February, but it feels like May. The volunteers, however, are mostly too tired to reflect on this discrepancy as they trudge to the cafeteria in their pajamas and slippers. The weather is similarly warm and pleasant in the mountains. It gets cooler towards the evening but you can always expect +10C on the slopes at daytime. 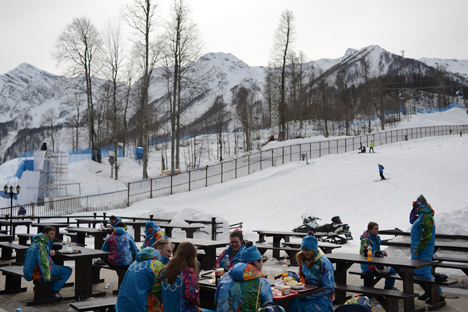 Although such mild weather is an extra bonus for the stadium environment, it has added to the organizers' troubles on the slopes. Even at the cross-country skiing and biathlon stadium, which is located high in the mountains, it is difficult to maintain the ideal snow conditions. My colleagues working there say the condition of the track is a constant concern, up to the very last minutes before a race, and that the organizers keep their fingers crossed at news conferences praying for as few complaints about the mushy snow as possible. Such complaints do get voiced, but you cannot please everyone. All I can say is that our specialists are working with the snow 24/7. The facility used both for ski jumping and the ski jumping part of Nordic combined is situated down below, slightly above the valley, and is more susceptible to weather conditions. There is no snow around the facility; although you will not see it on TV, the grey, snowless area surrounding the ski jump leaves a weird impression. The ski jump mostly uses snow that was collected last winter. This snow is treated with utmost respect. A billboard at the entrance to the track reads: "Attention, Olympic snow! It is a treasure to us all, please take good care of it!" The same instruction is repeated dozens of times at training sessions for those volunteers who work the ski jumps. The weather may not be entirely wintry but it serves as a great background for the Games. The sunlit Olympic Park with its radiant stadiums is mesmerizing. Up in the mountains, people prefer to crack jokes about the spring-like weather. During yesterday's ladies' ski jumping event, the team of volunteers who had been preparing the slope used the branches of a fir to lay out a palm tree in the snow. Where else can you find a palm tree on a ski-jumping slope? Only in Sochi.